The population was 8,715 at the 2010 census. 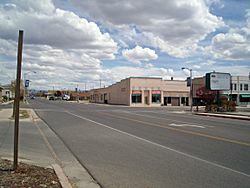 Price is the county seat of, and largest city in, Carbon County. Price is located in west-central Carbon County at the northwestern edge of the Colorado Plateau. According to the United States Census Bureau, the city has a total area of 5.1 square miles (13.1 km2), all land. The Price River, a tributary of the Green River, flows southeasterly through the city, and the San Rafael Swell is to the south. The city is on U.S. Route 6 and U.S. Route 191. US 6 leads 67 miles (108 km) northwest to Spanish Fork on the Interstate 15 corridor, while US 191 leads northeast 54 miles (87 km) to Duchesne. The two highways together run southeast 64 miles (103 km) to the city of Green River and Interstate 70. Utah State Route 10 leads southwest from Price 21 miles (34 km) to Huntington. Price was one of the communities that was served by the Rio Grande Zephyr passenger train. Today Amtrak's California Zephyr passes once a day each direction with a station about seven miles away in Helper. Price is located in an arid climate and features cold winters and relatively moderate summers. The average high in January is 37 °F or 2.8 °C and it rises to 90 °F or 32.2 °C in July. The low in January averages just 13 °F or −10.6 °C, and even in summer the dry climate keeps the nights cool, with an average of just 58 °F or 14.4 °C. The all-time record high is 110 °F (43.3 °C), which was set on August 3, 1918, while the all-time low is −31 °F (−35 °C), set on December 26, 1924. Price lies in the rain shadow of central Utah’s Wasatch Mountains so that precipitation averages only 9.24 inches or 234.7 millimetres annually. Late summer and early fall are the wettest times of year due to the Gulf of California monsoon that brings scattered thunderstorms to the region. The city also sees frequent snow during winter and early spring. This climatic region is typified by large seasonal temperature differences, with warm to hot (and often humid) summers and cold (sometimes severely cold) winters. According to the Köppen Climate Classification system, Price has a cool semi-arid climate, abbreviated BSk on climate maps. As of the census of 2000, there were 8,402 people, 3,045 households, and 2,085 families residing in the city. The population density was 1,979.7 people per square mile (765.1/km²). There were 3,311 housing units at an average density of 780.2 per square mile (301.5/km²). The racial makeup of the city was 90.70% White, 0.26% African American, 1.37% Native American, 0.56% Asian, 0.04% Pacific Islander, 4.25% from other races, and 2.82% from two or more races. Hispanic or Latino of any race were 10.08% of the population. There were 3,045 households out of which 34.4% had children under the age of 18 living with them, 53.2% were married couples living together, 11.5% had a female householder with no husband present, and 31.5% were non-families. 27.4% of all households were made up of individuals and 12.2% had someone living alone who was 65 years of age or older. The average household size was 2.60 and the average family size was 3.19. In the city, the population was spread out with 27.6% under the age of 18, 15.9% from 18 to 24, 22.5% from 25 to 44, 19.9% from 45 to 64, and 14.1% who were 65 years of age or older. The median age was 32 years. For every 100 females there were 91.7 males. For every 100 females age 18 and over, there were 88.3 males. The median income for a household in the city was $31,687, and the median income for a family was $39,429. Males had a median income of $37,476 versus $21,081 for females. The per capita income for the city was $14,313. About 11.4% of families and 15.0% of the population were below the poverty line, including 16.3% of those under age 18 and 11.1% of those age 65 or over. Price, Utah Facts for Kids. Kiddle Encyclopedia.